Dumpster Brawl! társasjáték - Magyarország társasjáték keresője! A társasjáték érték! 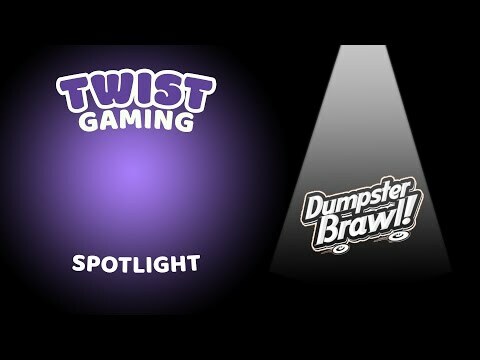 A Dumpster Brawl! egy kiváló társasjáték, 2 - 6 játékos részére, az átlagos játékidő rövid, csak 30 perc. A társast, 6 éves kortól ajánljuk kipróbálni. A játékmenet erősen épít a kollekció gyűjtés, a pakli tervezés, a minták és a kockadobás mechanizmusokra. • Play as one of the 6 cool animal characters – Iscratchu the Enforcer Cat, Rings the Criminal Raccoon and many more. • Battle the other players for the 13 different types of trash - BEWARE THE SLUGS! • This is a dynamic card game using dice based combat and YES, rummaging. 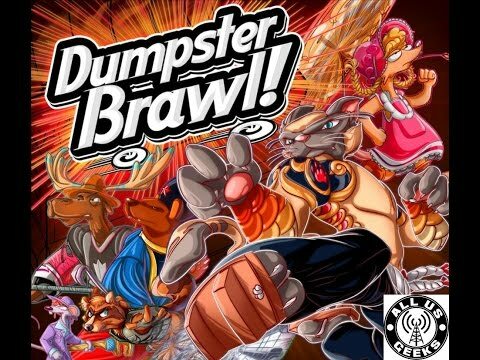 Dumpster Brawl is about rolling around in the alley against your opponents and trying to collect the sets of trash you need to claim victory from the other animals. Players meet in the alley of the city and take turns fighting for the control of the dumpster (where the trash is) and the right to rummage through it looking for what they need to complete their collections. To earn the right to rummage the dumpster, and the other players' hands, you need to defeat the other players in dice based combat and win your rumbles. The attacking is rolling for crowbars and the defender is trying to get enough trashcan lids to defend. The winner gets to root through the other players hand, or even put nasty things into it. If the winner is the person who started they fight they then get to rummage through the pile of trash. Rummage through the trash, while collecting trash cards and trying to create matching sets of items. Match the image and names of the items on the face of your cards. 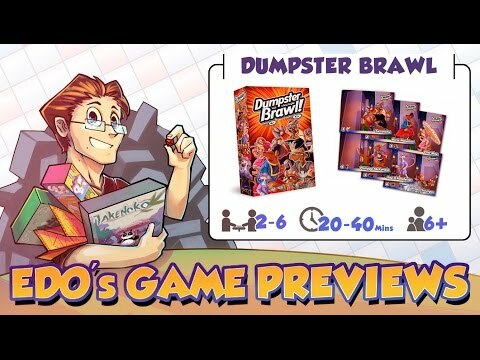 The goal of all versions of Dumpster Brawl is to collect enough matching trash items to make at least three (3) sets of three (3) or more matching items (such as three pizza boxes, three apple cores, and three soda cans) while not having any extra cards in your hand that are not part of the matched sets you are laying down. All extra cards, that do not match your victory sets, have to be discarded before you can lay your sets down and win. Note: You can have more than three sets and the sets can be larger than three cards. 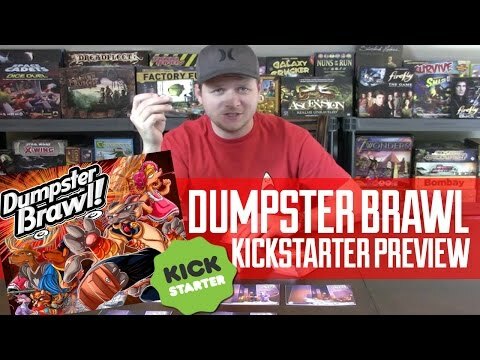 All play styles of Dumpster Brawl require the collection of the trash cards. There are thirteen (13) types of trash items and seven (7) of each item in the game. While rooting around in the trash you are, also, looking for booster cards that can help you win and defeating the blocker cards you might encounter as they can hurt your chances at winning but beware the slugs!